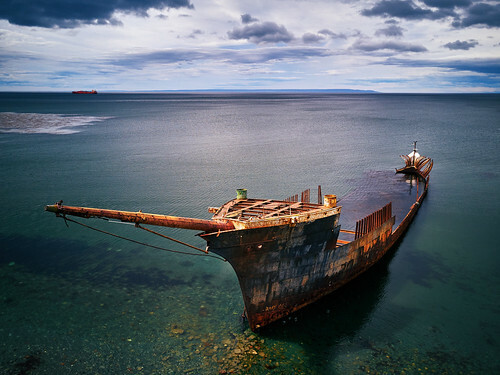 Contest #579: Wreck of the Lord Lonsdale, Punta Arenas, Chile – Where On Google Earth? Built in the late 1890s, The Lord Lonsdale sailed from Hamburg in 1909 on the way to the west coast of Mexico. As customary for the time, before the dangerous trip through the Straights of Magellan, the ship stopped off at Stanley Harbor in the Falkland Islands. While there, it caught fire. The ship was scuttled to put out the fire. But, you might notice, this is NOT in Stanley Harbor, but Punta Arenas. So, how did the shipwreck get there? A salvage company bought the steel hull of the ship. They tried to carry it somewhere — no one is quite sure where they were going, but they only got as far a Punta Arenas before they gave up. In 2007, the US reality show “The Amazing Race” (season 11, episode 4) featured the wreck as a milestone.